Walk into the rink at San Diego Ice Arena (SDIA) in the suburbs of America’s Finest City on any given day, and there’s a good chance you’ll see the place overrun by seven- and eight-year-olds wearing the Oilers’ distinctive navy blue, red and white sweaters. That’s because the program places a heavy emphasis on developing young players, and hockey director Craig Sterling knows the Mite age group holds the keys to creating kids who love the game enough to continue playing as they grow up. One of the keys to SDIA’s success has been its emphasis on developing players at the lower levels so they will learn to love hockey and continue to play as they get older. Sterling has placed a particularly heavy emphasis on the program’s Mite teams and has dedicated Dan Arel to not only coach the Mites, but to oversee the rink’s entire Mite offerings, from its travel teams down to the in-house and developmental offerings. Arel coaches a Squirt level in-house team and SDIA’s Mite A tournament team, while also overseeing the program’s three travel squads and four in-house groups. He’s in his fourth season with the Oilers and has an eight-year-old son in the program. “For me, at this age it’s all about helping these kids love the game,” Arel said. “A lot of parents come in and want to see their kid out on the ice looking like Connor McDavid or Sidney Crosby, but when I look at it, I just want them to smile the whole time they’re out there. I want them to have the puck on their stick and see what happens. The Oilers have experienced plenty of success over the years but wins and losses aren’t what truly drive Sterling to dedicate the approximately 50 hours a week he spends at the rink – not to mention the time put in at home to keep things running smoothly. Over the last decade, he has strived to create a family atmosphere within the SDIA program that extends from the youngest players trying the learn-to-skate sessions to the oldest players at the Midget level. Sterling’s goal ever since he started has been to create a family environment that keeps kids and their parents wanting to come to the rink and spend time there. From post-game meals in the expansive picnic area just outside the rink to team outings and other social events, he and his fellow coaches have developed a true community at their facility. This winter, SDIA has approximately 350 adult hockey players registered, including divisions for military and women, and there are about the same amount playing youth travel and in-house hockey for the 2018-19 season. There are seven Oilers travel teams at all levels as well as 14 recreational teams playing at San Diego Ice Arena. The program’s Pee Wee BB team and the Bantam A and B squads all enjoyed deep runs in the SCAHA playoffs this season. One of the things that’s a new emphasis for Sterling and his colleagues at the rink is attracting military members and their families. 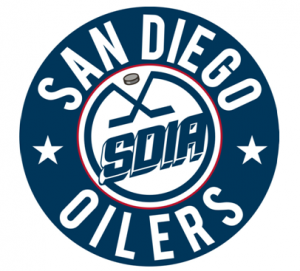 SDIA is within a short drive of Marine Corps Air Station Miramar and not far away from a number of other military bases, so the Oilers have taken extra steps to cater to those families. That means they often have a fair amount of turnover because military families tend to relocate often, but it also gives them the opportunity to bring in a lot of people from different parts of the country, and their adult hockey program serves as a recreational outlet for Marines stationed nearby, some of whom use the physical activity as a way to cope with symptoms of post-traumatic stress disorder. Arel said he loves the way Sterling runs the SDIA program, and it’s the reason he has stuck around as a coach and has kept his son playing for the Oilers.